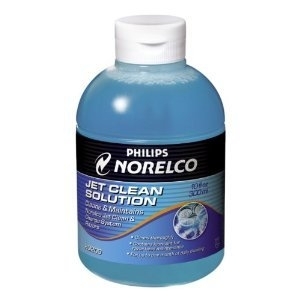 Norelco HQ200 Jet Clean Solution - 10 Fl. OZ. Norelco shavers are legendary around the world for their ability to shave closely, and have offered top quality construction since their introduction decades ago. With the introduction of some model series that feature a special cleaning and charging appliance, Norelco has found a way to ensure optimum shaving performance with little upkeep on your part. Because a clean shaver provides the best possible shave, having a shaver with its own cleaning system means there is no excuse for that shaver to not provide a superior shave at all times. Norelco's clean and charge jet clean system utilizes a special cleaning solution (HQ200) formulated to work within the cleaning appliance. When the solution becomes dirty, it is less effective at cleaning. Make sure you have fresh, clean solution at the ready by purchasing Norelco HQ-200 cleaning solution to have on hand. 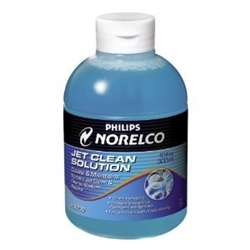 Philips Norelco HQ200 Jet Clean Solution for use with the following shaver models: 1050X 1050XCC 1250X 1255X 1260X 1280X 1290X 6828XL 6829XL 6846XL 6848XL 6865XL 6866XL 6867XL 6885XL 6886XL 6887XL 6891XL 7610X 7616X 7617XL 7800XL 7825XL 7845XL 7864XL 7866XL 7867XL 7885XL 7886XL 8160XL 8160XLCC 8170XL 8240XL 8260XL 8270XL 9170XL 9170XLC 9190XL 9195XL.